Blending beautiful images with the text of Sarah Young's Jesus Calling, this inspiring colouring book is an intricate and creative way to spend time with God. Looking to be inspired in faith and creativity? Sarah Young's bestselling Jesus Calling is the inspiration for this relaxing adult colouring book that also teaches you the art of hand-lettering, bringing a whole new area of creativity into your time with God. Enjoy peace in the presence of the Savior as you relax and reflect on the words of Jesus Calling through this gorgeous new Jesus Calling Creative Colouring & Hand Lettering. Favourite Jesus Calling quotes and scriptures are selected to hand letter--with a tutorial in the front of the book and faint guidelines on each lettering page--alongside 100 beautifully detailed colouring pages. Book includes quotes from Jesus Calling, 100 pages of intricate colouring designs, a tutorial and templates to learn basic hand lettering, and perforated pages. In addition to the beautiful, intricate adult colouring book art, enjoy learning the art of hand lettering with a simple guided tutorial and templates for hand lettering throughout the book. In the same way that the bestselling devotional offers a moment of peace during your busy day, so this new colouring book will remind you of His still, quiet voice in the midst of a bustling world. 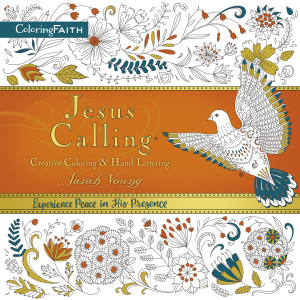 Jesus Calling Creative Coloring and Hand Lettering by Sarah Young was published by Thomas Nelson Publishers in March 2017 and is our 16875th best seller. The ISBN for Jesus Calling Creative Coloring and Hand Lettering is 9780718091262. Be the first to review Jesus Calling Creative Coloring and Hand Lettering! Got a question? No problem! Just click here to ask us about Jesus Calling Creative Coloring and Hand Lettering.